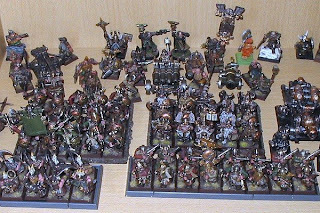 This is my painted dwarf army as it stands at the moment. There is a unit of 20 warriors, 10 miners, 16 thunderers and 15 longbeards. There are 3 war machines - a cannon, bolt thrower and organ gun. There's also a partially painted flame cannon. Characters are a couple of thanes, a runesmith and an army standard bearer. It's the army I am most likely to get painted this year, so I am posting it as an incentive to get it finished. If I get to the end of the year and it's not expanded to a fully painted 2000 points, I have failed in one of my resolutions. That's my main three goals for the year, adding any more will just muddy the water. I will be adding to my other armies too, but these are the Big Three for 2009. They are not ordered in any way, in fact I will be working on my chaos army in the next few weeks as I assemble enough troops to try them out in battle for the first time. That will give me a few ideas on how to progress, but already I am thinking about adding a converted war altar to the basic plastics I already have. More on that in a future post.